It is 1920, the eve of Walter Langdon’s 25th birthday and he is walking the fields of his Iowa farm. The first two pages of Some Luck by Jane Smiley are a wonderful description of him watching a pair of owls nesting in a big elm tree. And so starts the first book in this trilogy about the Langdon family. Chapter-by-chapter it tells of the family’s life, their farm, the ups and downs of daily life, births and deaths, and always the land. I came to this book fresh after reading A Thousand Acres and eager for more. Reading Jane Smiley [below] is a little like reading a novel by Colm Tóibín. Both writers excel at the detail, building the story slowly, like layers of frost thickening on a window in winter which starts off looking cloudy and finishes as an intricate design. As a reader, I trust both authors to deliver in the end. Will I be reading the next two books in the trilogy? Definitely. Some Luck is a book to be read over a quiet winter weekend, hunkered down on the sofa with an endless supply of mugs of hot chocolate. Don’t read it in short snatches, it deserves more than that and it will get beneath your skin. To read my review of A Thousand Acres, click here. For Jane Smiley’s own ‘Top 100 novels’ list, click here. 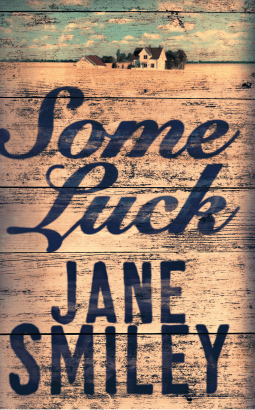 To read an excerpt from Some Luck, click here.